Grand mal seizures or tonic-clonic seizure is a type of seizure disorder that affects the entire brain. This type of seizure, grand mal seizures, is the most common type of seizure that is associated with epilepsy. In fact, there are still a lot of people who think that grand mal seizures are the only type of seizure disorder. In fact, seizures can come in many different forms with different symptoms. Some different types of seizure disorders include partial seizures, absence seizures, atonic seizures, tonic seizures, clonic seizures, and many more. The Preictal Phase (Prodrome Phase) – the phase before the actual seizure takes place. In some cases, preictal phase does not take place. 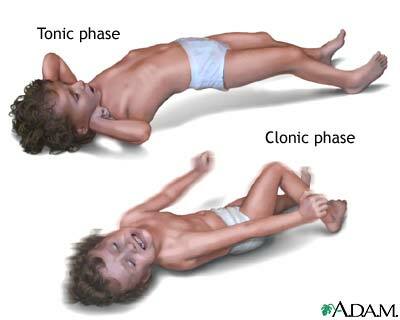 The Tonic-Clonic Phase – actual seizure phase. The Postictal Phase – the phase after the actual seizure took place. In all three phases of grand mal seizures, there can be nursing management or nursing care done to ensure safety to both the patient and the people around the patient. For people with known grand mal seizures, it is important to keep a suction machine (to prevent aspiration of saliva during seizure episodes), oxygen tank with mask, and keep the environmental stimulus to a minimum. For patients who have seizure precautions, nurses can pad the bed rails and the headboard to prevent injuries from happening during seizure episodes. 1. The Preictal Phase (Prodrome Phase) – during this phase, the patient usually feels an aura (feeling) that a seizure episode is about to happen. It is important for the nurse to tell the patient to inform anyone if he or she is experiencing an aura. An aura can tell that there will be an impending seizure attack. During this phase, make sure that the patient is in a safe place. Remove all tight clothing, jewelries, and other accessories. Remove any oral dentures, retainers, etc., that may obstruct the throat and dislodged during seizure episode. Keep away all sharp items and dangerous items from the patient. Place the patient gently down to the floor and make sure to place a soft support (maybe a big pillow) underneath the patient’s head. The bed is not an advisable place for a patient during seizure attack. The patient may fall during an attack. If there is no pillow available, you can let the patient place his or her head on your lap. Prepare necessary things (suction machine, oxygen tank, and anti seizure medication). 2. The Tonic-Clonic Phase – this is the phase where actual seizure takes place. During this phase, what the nurse can do is only to ensure safety of the patient. The nurse should not try to hold the patient down, since it can only cause injury. Just make sure that the patient’s head is safe and far from any danger. During this phase of grand mal seizures, you can gently turn the patient to his or her side when possible, to prevent aspiration of his or her own secretions. Do not attempt to place any object into the patient’s mouth. This could injure the patient’s mouth or teeth, or it could trigger the patient’s gag reflex, thus result to vomiting. 3. The Postictal Phase – the phase after the actual seizure took place. After seizures, the patient will feel confused and tired. Keep the environmental stimulus to a minimum. Nurses and other medical professionals should talk in a calm and reassuring voice. Keep the number of people inside the room of the patient to a minimum, to prevent sensory overload. The nurse should check for any injuries or lacerations that may had happened during seizure episode. During grand mal seizures, it is possible for the patient to lose bladder and bowel control. Check and help the patient clean in a slow and cautious manner when this happen.